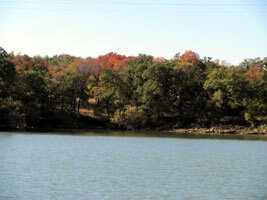 Lake Bridgeport is a secluded medium sized lake with 11,924 acres and is 20 miles long with 170 miles of shoreline. The lake is clear thanks to a rocky shore line and bottom. 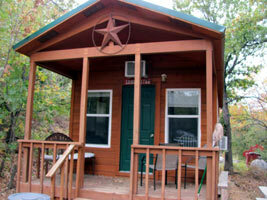 And it offers excellent fishing for crappie, hybrid stripped bass, and white bass. Most of Lake Bridgeport's 170 miles of shoreline is good bass habitat, with 7 miles of rip-rap, 90 miles of boulders, and many coves and points. If you don't have your own boat, rentals are available for guests at North Side Marina & Resort. See this Lake Bridgeport Fishing Guide page to find a guide - most of them will pick you up at your Lake Bridgeport fishing cabin. North Side Marina & Resort sits on a bluff overlooking a small protected cove on the northwest side of beautiful Lake Bridgeport. They offer a variety of vacation and fishing lodging from one bedroom one bath log and cedar cabins to a large four bedroom and three bathroom lodge that will sleep up to 20 of your friends or family. All of lodging has AC and heating, bathrooms with showers, TVs with DVDs and satellite, WiFi, full kitchens, mini to full refrigerators, linens, and all the utensils you'll need to cook a good fish dinner. The patios have grills, picnic tables, and fire pits. If you have a boat, there is a private boat ramp, boat gas, and overnight guest slips at North Side. If you don't have a boat, why not rent one of their pontoon boats. And the ships store has fishing gear and live bait. The fishing off their marina is also very good and a number of very large crappie have been caught. 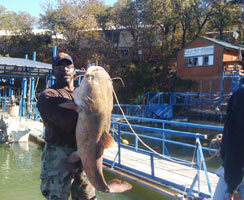 Below is a picture of a 70 pound catfish caught in 2010 - broke the lake record by 20 pounds!